Check out this great article on low impact living and biodynamic wine from the peeps over at the ReThink wine blog. Click here for the Rethink Article. My heart stolen….by a Barrel Thief! Saturday evening Megan and I ventured up to Barrel Thief Wine, the new wine shop/ wine bar/ café across from Short Pump Towne Center. We were heading there for some dinner and (of course) wine. Our disappointment about the limited by-the-glass wine list quickly dissipated while we were waiting to put our name on the list for a table (they were quite busy). We saw a cute little sign that effectively said, “see any wine in the shop you want, take it to your table and the waitress will open it for you, the price will be the retail price on the label plus six dollars.” Sweet, a $6 corkage fee!! So while we waited for a table, which was only about 10 minutes, we got to peruse the wine shop– it was like taking a virtual tour of their wine list. They have a nice, diverse selection, which according to what I read online is currently around 300 bottles, though it seemed like more. Once we were seated we looked over the menu, which consistedof salads, tapas-style dishes, cheese plates, panini and desserts. The back of the menu had information about the 12 wines they are serving by the glass. The wine we chose was a bottle of the 2005 Vietti Barbera d’ Asti, which our waitress gladly opened for 6 bucks and brought us two nice Schott Zweissel glasses to drink from. The tomato mozzarella salad had nice red and yellow vine tomatos with fresh mozzarella, layered with an excellent fresh pesto and topped with toasted pine nuts. The pesto really set it above the typical caprese salad drizzled with balsamic. Don’t get me wrong, I love the typical caprese, but this was a nice spin on the classic. The sandwich we both ordered was the portabella mushroom Panini which was layered portabella, manchego cheese and sun dried tomato pesto. It was very nicely grilled with a good amount of olive oil- not “greasy” in the slightest. Again, the pesto (this time sun-dried tomato) really set the dish off. It was also nice to have the manchego cheese instead of the typical mozzarella. We both enjoyed the sandwich thoroughly and the Barbera was a perfect match. Our only complaint was that the plate looked rather bare with just the sandwich halves sitting on it. There was no drizzle of sauce or garnish to add a little color to the stark white plate, but if you have to complain about something, I would rather it be that the plate looked naked versus the food. A few notes on the wine: As I said it was very nice pairing with the food that we ate for dinner. The mushrooms on the sandwich brought out the earthiness in the wine and the fact that the sandwich itself was not laden with oil and not too “heavy” allowed the fruit room to express itself. The Barbera had great aromas of plum, cherry and blueberry, with similar flavors on the palate followed up with a hint of tobacco. The tannins were definitely noticeable as we drank the wine prior to the meal arriving, but the food and the cheese in both of the dishes help manage those quite nicely. If I were to buy this for drinking at home, I would wait another year before opening it. For dessert we shared a miniature pound cake Panini with Nutella spread in the middle and some fresh whipped cream on the side. Holy cow it was good, and just the right size. The flavor of the grilled pound cake alone was fantastic. My mouth is watering as I am recounting the experience. To go with our delicious dessert we paired an Australian Tokay with it, which is quite similar to a Port in taste but is the Australian version of the Hungarian Tokaji (kind of like Shiraz is the Australian Syrah). It was a great treat, and was served in a unique dessert wine glass. In drinking the Tokay you could definitely taste the alcohol, but it was smooth, with nice round toffee and honey flavors. As you can tell we had a great time and plan to go back often. We talked with one of the owners, Ned I believe, who let us know that the 12 wines by the glass should be changing weekly and added me to the email list to get updates on what wines they are currently serving. So go check ’em out! Your heart will be stolen too! My thoughts on Virginia winery tasting room staff! One of my complaints about tasting rooms at wineries in Virginia is that a good percentage of the time the staff are not very knowledgeable about wine. Seems as though that should be one of the prerequisites for the job! Now of course I understand that wineries aren’t going out and hiring sommeliers to work the counter for $9 or so an hour, but at least give them a crash course on basic wine facts. Have you ever been in a situation where you KNEW the correct answer but some dumb comment made you think twice? Well this was that moment for me. I definitely did a double take in my brain. Alright, now I am not saying everyone in the world should know that the year on the bottle is the year the grapes were harvested, but if you are working in the wine industry that is definitely a must (no pun intended). I will say the staff were very friendly and personable, but this was just one of the many things they said that urked me. If you don’t know the answer to a question, just say I don’t know, that is okay. So am I being too picky? When we go to wineries where the staff is knowledgeable about wine we definitely let the owner or the person themselves know how much we appreciate it and them. It just makes the experience for us that much more enjoyable, especially when you have to pay for the tasting. I have been hearing good things about Karsens in Carytown, but unfortunately I couldn’t seem to find a menu online. Well yesterday the Times Dispatch did an article on Karsens and within the article posted the restaurants website. So I was all excited to see what entrees they had on their menu – for a Vegetarian. And to my amazement (not really), and confusion another fine dining restaurant in Richmond has not one single Vegetarian entrée on the menu. Come on people, this is ridiculous and it totally baffles mine and Megan’s mind that any restaurant not to mention fancy ones don’t have ONE vegetarian option. I am not asking for 2, 3, or 4, just 1. And yes I know if you go there with other people, usually the chef can whip something up, but sometimes not. This is not a stab at Karsens, just at fine dining establishments in general that commit the “crime” stated above. Their menu does in fact look delicious for someone who eats meat and fish. I think that current statistics claim 15% of the population is vegetarian, that is a pretty good number of restaurants goers. So fine dining establishments here in Richmond and across the country listen up, I want to give you my money so get creative and give me a veggie entree option!! Thank you for letting me rant! Ha ha!! Hello again everyone – here is the list of what Jeff will be serving up this Friday for his FREE tasting at the Wine Cellar. So with grape harvest in Virginia wrapping up, there are many winery open houses and festivals to help you celebrate the fact that October is Virginia Wine Month. Click the link to the Virginia Tourism site to check out a complete list of what is going on this month around the state. A small plug to the family winery right here in Richmond (well Midlothian is close enough) Woodland Vineyard. We are having a open house on Saturday October 13th from 12:00 to 5:00. Click HERE for more info! Also Woodland Vineyard is going to be participating in Powhatan Festival of the Grape this year so come check us out as well as all of the other participating wineries. Tonights wines are all from the Columbia Valley in Washington State. See you tonight 5-8, and FREE as always! This past Friday Megan and I ate at Pasta Luna on Southside for dinner. It had been over a year since we had been back due the last time being a horrible dining experience from the service that was horrible to the rigatoni that tasted like it had a pound of salt on it. We recieved a coupon in the mail that offered a free entree and let us know about a new menu for fall. We figured that was enough to give them another shot. We were wrong. Well that is a little harsh, our service was a lot better and for being as young as she was our waitress Cecilia was very good, a welcome change. We ordered a bottle of Rufino Aziano Chianti Classico Frescobaldi for $36 which was very nice. The wine had good cherry fruit aroma, tobacco, leather and blackberry flavor on the finish. A comment on their wine list, it has been shortened since the last time we were there and is now way overpriced with limited selection. We ordered the Insalata Gorgonzola to start which was pretty good, but they could’ve used a lot less dressing in our opinion. For the entrees I ordered a porcini mushroom stuffed gnocchi with a roasted walnut cream sauce. The entree is supposed to come with a lobster cream sauce but since we are vegetarian I switched it up. The sauce worked out well and the gnocchi which was okay but slightly bland, with the porcini filling deserving better seasoning. Megan ordered the asparagus and tomato tortellini with brown butter sage sauce. On sight the butter sauce looked closer to my cream sauce than anything else, and upon tasting it there was no real evidence of sage and it was way to creamy for our taste. The tortellini itself was definitely premade, which they do say on the menu that it is imported from the finest italian chef, Bertolli for $3.99 tastes better. The most odd part of Megan’s meal was the fact that it had nothing in it that resembeled asparagus or tomato and in fact it tasted like sweet potato. We let our waitress know this and aksed if there was another tortellini that we may have gotten by mistake. In fact that is the only tortellini on the menu and that she had had it before and thought it did taste like sweet potato or pumpkin. She did apologize for the dish not being what we expected. For dessert we had the Tiramisu which was actually really good, as well as ordered 2 cups of coffee that took a while to come out. When the coffee arrived it was definitely burnt, a nice carmalized, cooked on the bottom of the pot taste, very dissapointing. When we got home we checked the menu on the website to see if they had another toretllini that the waitress didn’t know about. In fact they have a pumpkin tortellini with butter sage sauce but not the pasta that Megan ordered with apsaragus. GO FIGURE!! If they are going to update the menu, make sure the kitchen knows about it. After this “great” review and our experiences in the past I really wonder how they keep being rated the best Italian in all of Richmond, which they proudly display on a sign outside of the restaurant. Is it the location on Broad street that is winning all of the awards? There are quite a few Italian restaurants in Richmond both casual and fine dining that blow away Pasta Luna on flavor of the pasta dishes. Now we are vegetarians and don’t eat the meat or seafood dishes, so maybe that is where there excellence lies. Overall our dining experience was fine but the meal coming in at $72 with our free entree before tip wasn’t worth it. Those of you that have a great experience, enough to garner it the best Italian in Richmond, please post your comments. How many people do or don’t want to see how many calories are in a glass of wine? Did you know that if a wine is less than 14% alcohol wines don’t need to list the specific percentage level, and that they need only label it with “Table Wine”? Do you think wineries should be forced to put the above on their bottles, or you really don’t care? Thanks to an article in Wines and Vines News entitled “Time to Comment on New Label Rules” I was reminded that this is a current issue in wine legislation. And good news the deadline to comment on the issue has been extended 90 days. YAY! There is a link on the bottom of the article at Wines and Vines to comment electronically so please do so if you have issues or suggestions around this legislation. See you all there 5-8. Friday night tasting at the Wine Cellar this Friday September 14th. This Friday Jeff is offering up some BIG REDS from California. FREE AS ALWAYS FROM 5-8pm. FROM THE CLARE VALLEY, AUSTRALIA. THESE WINES ARE JUST BEING INTRODUCED TO VIRGINIA! PLEASE STOP BY AND MEET MITCHELL, AND TASTE HIS WINES. 5 – 7 PM AND FREE AS ALWAYS! Our second and final winery (cantina) that we visited was Rizzi in the Barberesco zone in the small town of Treiso, north of Alba. This was about a 15 minute drive from where our bed and breakfast was that you saw in the previous post about our Italy trip. Again we had the great opportunity to tour and taste with the winemaker himself and get great in depth, first hand knowledge of how the wines were crafted. We started our experience at Rizzi with a tour through the vineyards on property surrounding the winery. Ernrico (yes the young winemaker at Rivetto was also Enrico) pointed out to us the varying crus that Rizzi owns that you could see from where we were standing, and vineyards within those crus, from which would be tasting the wines. Check out the picture below that outlines their different Crus which are all in Treiso. 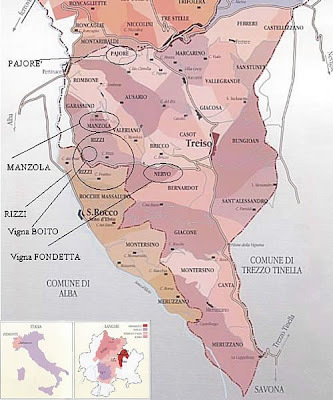 Since Rizzi is in the Barberesco zone that is the primary wine they produce which is from the Nebbiolo grape as was the Barolo. In addition they produce Dolcetto, Chardonnay (which is not typical for the region), Barbera, and Mosacato (or Muscat). These first 3 wines we tasted with Enrico in the bottling room overlooking the vineyards. Chardonnay 2006 – very nice Chardonnay. (All stainless, no oak) apple, pear, stone, wheat, and a slight tropical aroma. They did an outstanding job on a varietal not typical for the Langhe region. Dolcetto D’ Alba 2005 – we thought it was slightly tannic for a Dolcetto, but still quite smooth, with flavors and aromas of raspberry and cherry. Good structure. 2005 – huge difference from the 2006, blueberry again, chocolate bar, dirt aroma, this would be really nice to bottle now, smoothing out well!! 2005 – smoothing out, still get the tobacco flavor, nice black cherry pie with a slightly burnt crust aroma – good finish, nice wine. As a special treat to us, Enrico allowed us to taste one of Rizzi’s dessert wines, the Frimaio Vendemmia Tardiva. This is a late harvest Moscasto (Muscat) with about 8% Residual Sugar, definitely a sipper! One of hte most extraordinary things about the wine is the label, the graphic on each label is hand painted by Enrico himself, so each bottle is different. How aweseome is that! Frimaio Tasting Notes: apricot, floral, and canned peaches on the nose, similar flavors on the palate, full bodied in the mouth but not cloying, flavor lasts a long time after the wine has left the mouth. THis would be fantastic with some really strong cheese. Well needless to say all the wines were awesome, but we couldn’t leave with everything. We decided to buy 2 of the Chardonnay which were really good, and so inexpensive, about $8 US dollars. We also bought two of the 2004 Pajore Barberesco and two of the Frimaio dessert wine. Definitely give Rizzi a try, you can find their Barberesco here in the states…currently that is the only wine they export. And if you happen to be in the Piedmont region of Italy give them a visit. This week Jeff and his crew at the Wine Cellar will be tasting some great wines from Washington State. I am excited about the Northstar Merlot, we have a bottle at home in the cellar that I got for a gift that I have been chomping at the bit to try. Tonight from 5-8, see ya there! Here are this weeks wines that will be tasted….for FREE. Unfortunately I will not be there this week. Don’t feel sorry for me, I will be at the beach. I know I promised the second part of our Italian wine tasting about a month ago, look for it soon I promise, plus a trip to some Central Virginia wineries and more updates to my CORKD tasting notes.